Granite is a common and widely-occurring group of intrusive felsic igneous rocks that form at great depths and pressures under continents. It is made of large mineral grains that fit tightly together. Granite is a natural stone product. 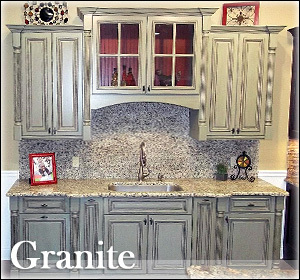 The variation in color and pattern is a natural characteristic of granite, which makes every piece unique. Granite is heat and scratch resistant. Granite will have to be resealed but it is fairly simple wipe-on, wipe-off process with the proper sealer. We recommend sealing granite once a year. 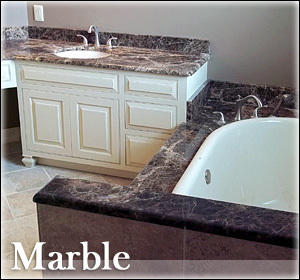 Marble is metamorphosed limestone, composed of fairly pure calcite. It is extensively used for sculpture, as a building material, and in many other applications, such as countertops. Marble is the most porous of all. Quartz is the most common mineral found on the surface of the Earth. A significant component of many igneous, this natural form of silicon dioxide is found in an impressive range of varieties and colors. Quartz is composed of natural stone. It is compose of 93% quartz along with color and resins. 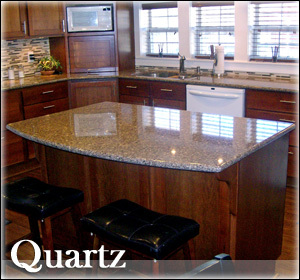 Quartz is heat, scratch and stain resistant. It also has a manufactures warranty against material defects.